The good news: my floors have probably never been cleaner. The bad news: it is because of the dog. Since the arrival of our little chunk of light, our cocker spaniel has maintained her status quo of quasi-despondency, quasi-independence, quasi-sweetness. Our weimeraner, however, has developed a brand new level of anxiety… partially because we are now the owners of a brand new bald puppy who squeals and rolls and takes our attention, partially because we have new-to-us sofas that are forbidden to him (ha. ha. ha. we know he is on them every chance he gets), partially because we have lots of new visitors, and partially because he’s just been a threenager jerk. This week his reign of terror has led to: 8 brownies eaten (probably more), 6 tubs of granola eaten, 8 piles of vom cleaned and scrubbed, 1 library book destroyed (consequently, book will need to be paid for), 3 bananas punctured (and currently being baked into baked oatmeal in the oven, ’cause surely 375 degrees will bake off that dog drool), 1 Mother’s Day card shredded, 1 package of pretzels ripped apart, 1 bowl of rolling sugar eaten, 1 package of rice noodles opened, 1 box of jambalaya rice confettied across the nursery, 1 box of Earth’s Best oatmeal cereal spread around the downstairs and under the TV stand. And, HOORAY!, about 14 passes of the vacuum around the house, carpets spot cleaned, granite countertops scrubbed clean innumerably and downstairs floors mopped 4 different times. So. Thanks, Knox, for being a turd. You’ve turned me into a really great reactionary housekeeper. Motherhood is sooooo hard, y’all. Winky face. Here’s what we’ve been eating in between dog containment! Salmon Cakes – Because cakes just sound higher-class than patties. They just do. This was my first time making these, and even though I got nervous as they were coming together, they turned out well! Davey commented twice that he really liked them. As per the note in the recipe, I added a diced jalapeno to the mix. This morning for breakfast I reheated two and put them underneath eggs over easy. These would make a great brunch dish. Smoked Paprika Chicken Wraps – I can’t get enough of these. So easy. So tasty. BBQ Chicken Quinoa Salad – This dish is always a winner. I brought some of this to a mama meetup lunch picnic shindig, and it seemed to be a hit all the way around. The salad is equally tasty warm as it is cold. I cooked 3 chicken breasts in the crockpot on low and turned 2 of them into barbecue chicken for the salad. The other breast I shredded and seasoned with salt, pepper and smoked paprika. I combined that with farro, nuts, cheese, spinach, and sauteed shredded Brussels sprout for a secondary easy salad to snack on for the week. Double meal win! Spicy Sausage Pasta – Comforting. Nourishing – not healthy (thanks a lot, cream and cheese!). Delicious. 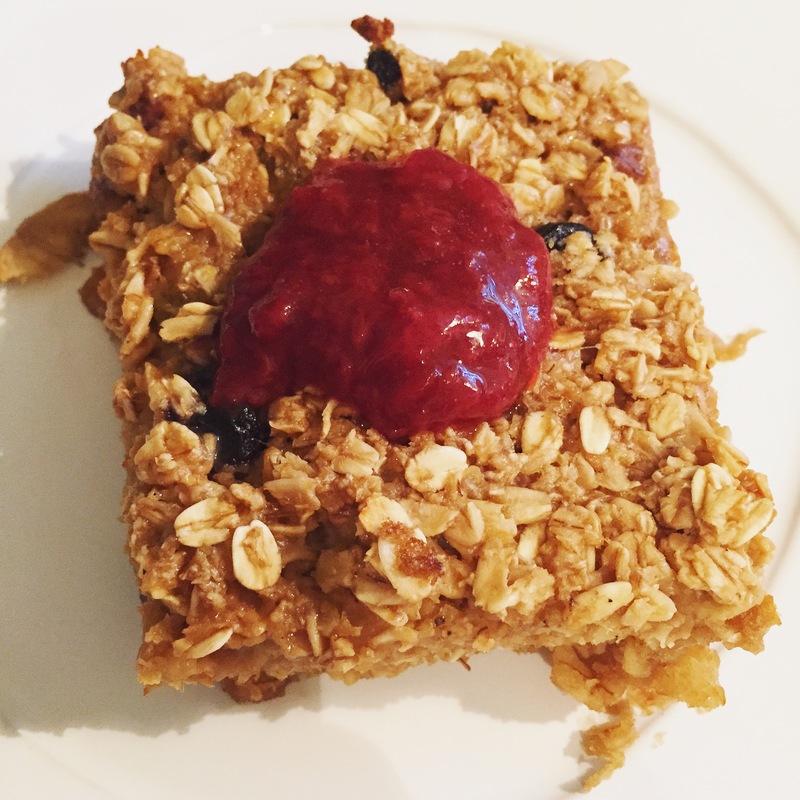 Easy Baked Oatmeal – I have the second batch of this for the week in the oven as I type. It’s a family favorite that my sister and mom bake regularly. I like to layer the bottom of my dish with sliced bananas sprinkled with brown sugar and stick it in the oven while the oven heats up. I use dried blueberries or dried cherries (my sister and mom use fresh fruit like blueberries in theirs… yum!) and sub applesauce for coconut oil, just because I almost always have it on hand. I reheat it in the oven each morning then top it with homemade strawberry-balsamic jam (as pictured above). An ideal grab-and-go breakfast!